When Typhoon Marakot struck the Philippines’ main island of Luzon last week, a faulty dyke was breached, leading to massive flooding and displacing thousands. If the local government had set aside a few million pesos to repair the dyke, the disaster could have been prevented, said Richard Gordon, the main proponent of a Disaster Risk Management Bill, which if passed, will ensure municipal governments allocate at least 5 percent of their budgets to disaster risk management. The proposed bill is one of several measures that the Philippines, one of the world’s most disaster-prone countries, has announced to boost preparedness. The Philippines, a middle-income country comprising 7,000 islands, leads a World Bank list of nations most in danger of facing frequent and more intense storms because of climate change. In 2008, it was one of three countries that experienced the most disasters, according to the Brussels-based Centre for Research on the Epidemiology of Disasters. Provincial and municipal governments across the country are being urged to take the initiative and use their powers to forcibly evacuate residents during a natural disaster, Glenn Rabonza, chief of Manila’s Office of Civil Defence (OCD) told IRIN. "We are a hazard- and disaster-prone country simply and unfortunately because of our geographical location. We get about 20 or so typhoons a year, about seven of them potentially destructive," Rabonza said. Apart from the typhoons that blow in from the Pacific Ocean, the Philippines also sits on the Pacific Rim of Fire where periodic earthquakes occur, Rabonza noted. And while the country has not had one as powerful as the one that devastated Szechuan in China or Pakistan-administered Kashmir in recent years, "ours are smaller-scale, periodic and too often affect large populations", he stressed. The government also hopes to complete an updated "mapping of flood and landslide prone areas". Early warning, forecasting and monitoring systems have been improved, with at least 10 new radars installed in the typhoon-entry zones in the eastern Bicol region to alert the populace. Gordon, who also chairs the Philippine National Red Cross, stressed that government spending on disaster prevention and preparedness measures could significantly curb the billions spent on relief and rehabilitation. "Without disaster prevention and preparedness, we will for ever be pouring money into a bottomless pit and the cycle of disaster and poverty will continue," he said. The government is also trying to emphasize "disaster mitigation and pre-emptive evacuation", mainly because many poor residents often ignore government warnings to leave disaster-prone areas, including riversides, slopes, hills and illegal mining operations, said Rabonza. 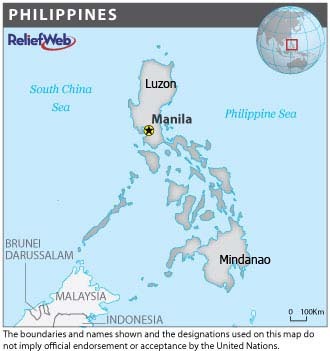 One such area is the eastern portion of Manila, with a population of about 15 million, which sits on the West Valley or Marikina Fault. It has registered several earthquakes in the last 1,500 years. Scientists fear that if the fault moves drastically it could trigger a 7.2 magnitude quake, flattening buildings and resulting in about 35,000 deaths and injuring 100,000, Rabonza said. The private sector in Manila, including owners of major business establishments, has stepped up earthquake drills. "We have put in place action plans already, including massive earthquake drills among schools. We are trying our best to prepare ourselves, but let's face the fact that no country, no community, no nation can be truly fully prepared if there is a sudden onset of disaster like a massive earthquake," Rabonza said.